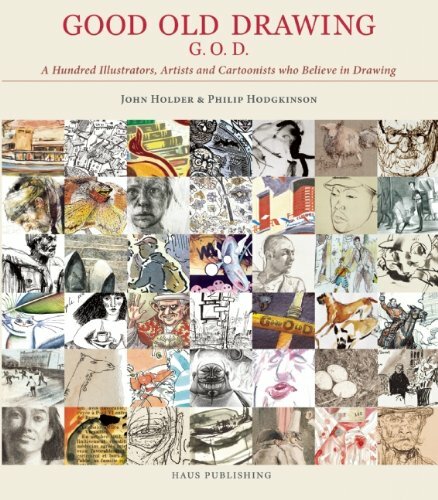 Book Review: Good Old Drawing: G.O.D. Good Old Drawing: G.O.D. is essentially a book of inspirational quotes and thoughts from selected respected illustrators known for their hand drawn art. Included are David Hockney, Ronald Searle, Quentin Blake, Peter Brookes, Ralph Steadman and more to a total of hundred. The book celebrates hand drawn traditional art as compared to digital art that's so prevalent nowadays. There are lots of varying styles and drawing media to look at. Each artist in the book has one or two artworks featured so it's not really representative of their actual work. The quality of work featured is a mixed bag, such as scribbled drawings for example, but emphasis here is really on the act of drawing traditionally rather than on the technique aspect. This is certainly not your usual book on drawing, but it's still interesting to read about how other illustrators feel about drawing.